Over the weekend it was revealed that Game of Thrones fans are going to have to wait until the end of May 2019, at the earliest, to see Season 8 of the hit show. 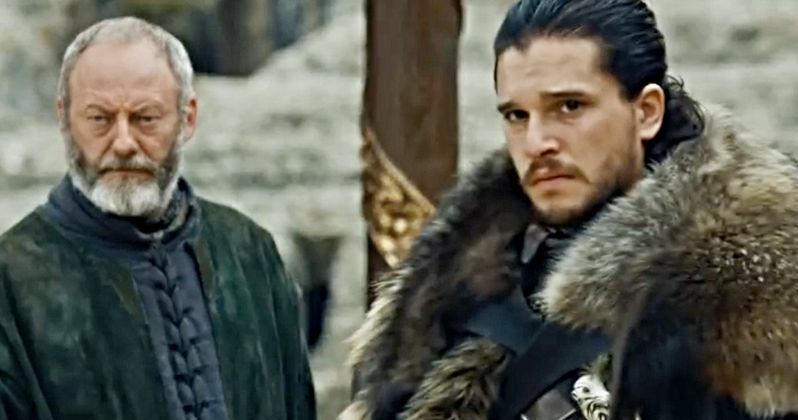 While that is disappointing, HBO has released a sizzle reel featuring footage from their upcoming original shows, including the first footage from Game of Thrones. However, it's only about three seconds long, which isn't much. But at this point, fans of the popular series will take anything that they can get. In the Game of Thrones Season 8 footage that is teased in the HBO sizzle reel, Jon Snow and Sansa Stark are seen reuniting in Winterfell. Sansa has a concerned, almost haunted look in her eyes, teasing that all is not right in this reunion. As for the rest of the footage from the show that is featured, it's all taken from last season and features some of the more epic moments, including dragon action, a brief look at the Night King, and the fake alliance between Daenerys and Cersei Lannister. Game of Thrones visual Effects supervisor Joe Bauer recently revealed that the team is working hard on Season 8 at the moment and that he expects them to keep working until May of 2019 on all of the visual effects. While this sounds like a recipe for disaster for the premiere of the last season, Bauer also noted that things seem to change in their department on a weekly basis, meaning that they could finish up earlier if all of the timing aligns perfectly. Or things could go the other way as well, making a summer of 2019 debut more likely. HBO has yet to announce a release date for Season 8 of Game of Thrones and fans have started to get a little antsy. After the weekend report of a delayed Season 8, HBO's president of programming, Casey Bloys, maintained that the final season will premiere in the first half of 2019, which sounds pretty promising and vague at the same time. It seems that the network is seeing how long it takes for the editing and visual effects process in the first few episodes to announce anything official as to when we can expect to see the return of the hit show. As for what's going to happen in the final season of Game of Thrones, that's anybody's guess at the moment. Cersei Lannister seems to have no concern over the Night King and his undead army, which now has a dragon. But she agreed to a phony alliance with Daenerys that will certainly play a huge role into how the show ends. Again, nothing specific has been revealed, so fans are left to speculate. At the very least, there's the quick tease of new footage that the network has given to fans. You can check out the first footage from Game of Thrones Season 8, below, thanks to the HBO YouTube channel. The footage in question shows up at the 1:11-minute mark.